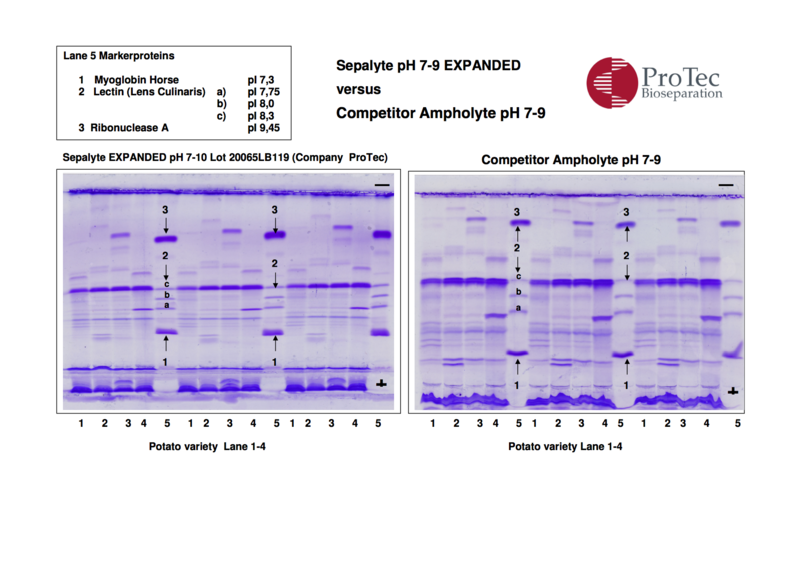 ProTec Bioseparation specializes in the production of high-quality ampholytes for isoelectric focusing (IEF) and custom-designed kits for the analysis of seed purity such as our Hybrid Purity Testing Kit for maize and the new I.E.F. HighSolvSystem for variety testing of wheat (picture above). We have given the optimised IEF technique its own name because the results achieved with the ProTec I.E.F. HighSolvSystem stand out so positively from those obtained with the standard method that there can be no comparison. Over 30 years of experience in the manufacture of carrier ampholytes and sustained efforts to optimise IEF separation performance have led to the product we now call Sepalyte™. See the NEWSLETTER for up-to-date IEF applications.